Now that the new year is in full swing, countless workers will no doubt start dusting off their resumes and applying for different roles. If you're hoping to get a better job this year, you should know a thing or two about when hiring tends to peak and decline. Of course, there's no exact science when it comes to timing your job search. A company can randomly post an opening during an otherwise slow month, and if you catch it in time, the position could be yours. That said, in 2017, Monster.com saw job listing spikes in seven different months: February, March, April, May, July, August, and November. On the other hand, Executives Online analyzed 10 years of hiring data and found that the most popular months to advertise openings were February, March, May, June, October, and November -- so while there's some overlap with Monster.com's data, it doesn't perfectly align, either. So when should you look for a new job? Here's a basic guideline to follow, keeping in mind that there are always exceptions to the rule. The beginning of the year is generally a great time to seek out new job opportunities because after a mostly dormant December, companies are typically eager to hire. Granted, you may not see too many openings at the start of January, because that's when businesses will be easing back into the swing of things after the holidays. But come mid-to-late January, you're likely to see an uptick in job postings, which often carries well into February. Another reason it pays to look for a new job early on in the year? Companies often get their hiring budgets renewed at the start of the year, which means they have more flexibility at that point as far as salaries go. Current growth in Phoenix is slower than it was during past booms, but the economy is still creating jobs. The Phoenix metro area is chock-full of small businesses — 96 percent of the region's 126,000 businesses have 50 or fewer employees. The leisure and hospitality sector is booming, with growth of 7.1 percent from July 2016 to July 2017, according to the U.S. Bureau of Labor Statistics. The next fastest-growing sector was construction, with 3.5 percent growth over the same time frame. Strong economic activity and net migration are expected to push home prices higher, which could have positive, ancillary benefits on the economy. Boston is a college town, home to prestigious institutions likes Harvard University, Massachusetts Institute of Technology and Boston College. In fact, as of 2016, the city had the largest concentration of top-tier research universities in the country. Boston also has a number of the country's best hospitals, including Massachusetts General. Thus, it is no surprise that the highest level of employment in the city is in education and health services. Dallas is a bright spot in the Texas economy. Economic growth over the next five years is expected to reach 4.2 percent per year, according to the city's economic forecast. Dallas is a key driver of economic growth in the state, according to the Dallas Chamber of Commerce. The city is blessed with a diverse economy and its business concentrations are in logistics, technology and corporate headquarters. San Francisco is the fourth most-populated state in California and it runs neck-and-neck with Los Angeles when it comes to having the most job openings. With a well-known concentration of financial services companies, including Wells Fargo and Charles Schwab, it should be no surprise that the professional and business services industry is No. 1 when it comes to employment in San Francisco. Los Angeles is the capital of the world for show business — and it's the largest city in the state. As a result, the city's economy is naturally large and diversified. Away from the glitz and glamour of Hollywood, Los Angeles is also the home to the nation's No. 1 container port, which makes trade its top industry. Education and health services come in a close second. Seattle's economy is well-rounded, which results in many job opportunities. Seattle offers employment in a variety of industries, ranging from trade to transportation and utilities to professional and business services to government to education and health services, according to the U.S. Bureau of Labor Statistics. Seattle's economic development plan focuses on "business cluster development," or the effort to align companies in a geographic area that work in the same industry. The city believes that this type of coordinated, economic development activity is the key to Seattle's economic growth. 5. Jobs in Washington, D.C.
As befitting the nation's capital, government jobs in DC make up the largest employment sector. The city also offers high levels of employment in the fields of professional and business services and education and health services. The city has several organizations and agencies that focus on potential economic development opportunities, and it has initiatives designed to develop small business owners. The city's economic development plan identifies the energy, manufacturing and medical sectors with the most robust growth. Atlanta's two main industries — in terms of the percentage of the population that is employed in those fields — are sales, administrative support, management, business and finance. The city, however, also employs those in the science, education, library, engineering and computer sectors at a rate above the national average. The city's most recent Comprehensive Development Plan was adopted on Nov. 21, 2016, to further economic growth in the city. Invest Atlanta, the city's development authority, is focused on growing residential and commercial economic vitality in the city. Chicago, has the second-highest number of job openings on the list. Chicago's economy is guided by an economic development plan entitled, "A Plan for Economic Growth and Jobs," created by World Business Chicago and the city's mayor, Rahm Emanuel. New York City boasts a growing, diverse economy that has many growing industries, hence its No. 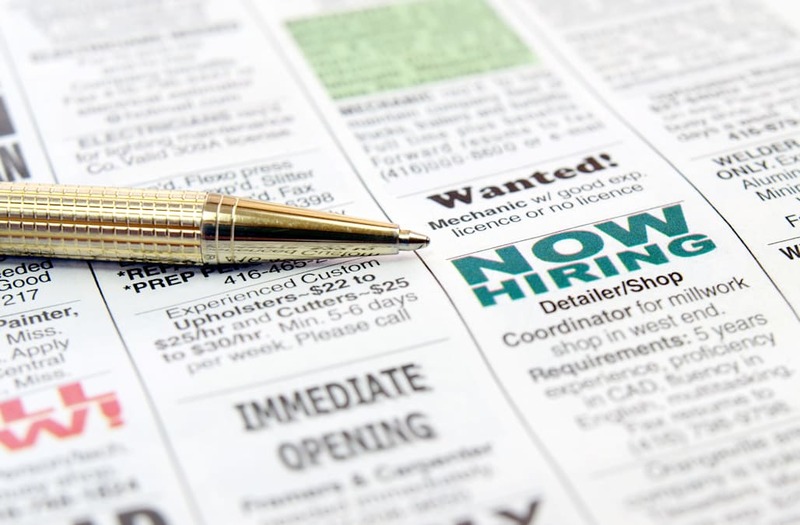 1 position in this list of cities with job openings. New York's core businesses include technology, fashion, food manufacturing, food retail, healthcare, industrial and manufacturing, life sciences and urban innovation and sustainability. New York is particularly booming when it comes to the startup sector, which accounts for more than 291,000 jobs and more than $124 billion in economic output. Though there are certain benefits to applying for a new job in January or February, hiring doesn't necessarily slow down in the months that follow. In other words, March, April, May, and June are all good months to get your resume out there and line up interviews. Furthermore, because companies are often anxious to fill open positions before the summer months, you may even see an increase in hiring during May and June, which the preceding data points to. Summertime tends to get a bad rap as far as hiring goes. The logic is that since people tend to take vacation during that time, it's not the best period to be looking for work. But if we look at Monster.com's data, we see that July and August were among the more popular months as far as new job listings were concerned. The verdict? Expect the hiring process to move more slowly during the summer, but don't shy away from applying, either. The three-month period between September and November is generally a pretty good time to seek out jobs. First of all, companies that slow down on hiring during the summer will often compensate by ramping up during the months that immediately follow -- especially those intent on filling key roles before the end of the year. Along these lines, companies will often attempt to fill open positions before the holiday season kicks into gear and year-end reviews start monopolizing the bulk of everyone's time. If there's one time during the year that's generally not ideal on the job search front, it's December. First of all, at that point, it's common for hiring managers and decision-makers to either be away for the holidays or get busy focusing on other things. Furthermore, come December, company budgets are often maxed out and don't renew until the following year. But that doesn't mean you shouldn't start reaching out to contacts in December if you're looking to get the ball rolling on your job search. Quite the contrary – if you know you want a new job, start networking aggressively so that when things open up in January, you'll be at the top of your associates' lists. No matter when you decide to look for a new job, the key is to be patient and thorough. With any luck, you'll eventually land a role that serves your career well.